Ilocos Norte Governor Imee Marcos is urging other provinces to implement her province’s ‘Pantawid Ani’ to aid farmers during calamities, such as the El Niño phenomenon. The senatorial aspirant expressed hope that the national government will also adopt the program for the benefit of farmers all over the country. “Kapag panahon ng El Niño o bagyo at nasalanta ang isang magsasaka, kung merong cash-for-work sana kahit sa loob ng tatlo hanggang anim na buwan, malaking tulong sa kanila ang Pantawid Ani (In times of calamities like El Niño or typhoons, if there is cash-for-work even within three to six months, Pantawid Ani will be a great help for the farmers),” she told farmers of this town at the Bayambang Pista’y Baley-Agew na Dumaralos (Farmers Day) on Tuesday. 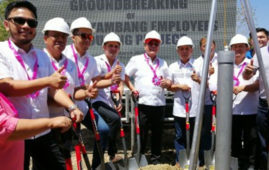 Marcos said ‘Pantawid Ani’ will be the counterpart for the cash-for-work program of Department of Social Welfare and Development for Pantawid Pamilya Pilipino program beneficiaries, for the Tulong Panghanapbuhay sa ating Disadvantaged/ Displaced Workers (TUPAD) Program of the Department of Labor and Employment, and Department of Public Works and Highways’ program for unskilled laborers. In Ilocos Norte, Marcos noted work opportunities under the Pantawid Ani program includes planting of mangrove for those residing at the coastal areas, tree planting at the mountains, de-silting of rivers and repair of dikes, among others. “Some are into planting of dragon fruits and other high value crops. With about three million tourists visiting our province every year, some farmers are now into farm tourism through their dragon fruit farms. Ang importante, nadadagdagan namin ang mga trabaho dahil sa madaming turista ang dumadating. Ang mga turista ay nagbabayad naman ng entrance fee (What is important is that we are adding more jobs because of tourist influx in our province. Tourists pay entrance fee),” she said. Some fishermen have extra work as tour operators using their motorboats, while some senior citizens are working as tour guides, Marcos said. Some 10 out-of-school youths (OSYs) in.